Leading up to this, from 2007 to 2011, advertisers and publishers cranked up tracking-fed advertising, aka “behavioral” advertising. Or, to the business itself, adtech. Google says data for September, at the right edge of that last chart, is partial. Given the media coverage going to adblock + war (and Apple’s support for “Content Blocking” in IOS 9), interest is sure to stay high. The only way engagement will work is through tools that are ours, and we control: tools that give us scale — like a handshake gives us scale. What engages us with the Washington Post should also engage us with Verge and Huffpo. What engages us with Mercedes should also engage us with a Ford dealer or a shoe store. That path leads to a pair of related outcomes. And we’ll prove it to them. Because we’ll have the power to do that, whether they like it or not. More on all this in my People vs. Adtech series. † [Added 3 March 2019] The last numbers I could find on this were in 2017, and I reported on them here. 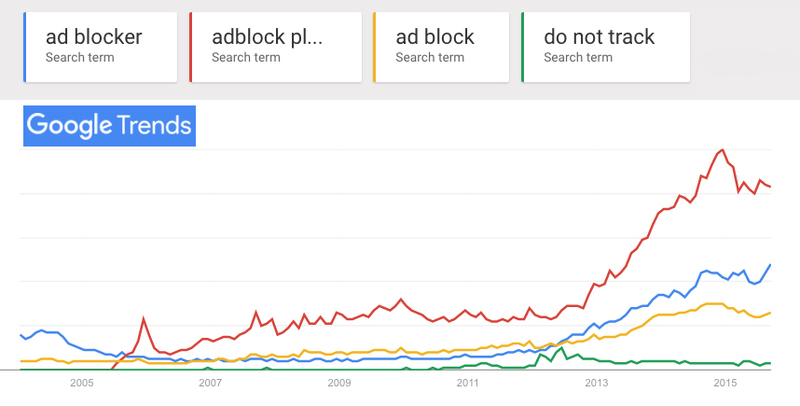 They said 1.7 billion people were blocking ads online by that time. No doubt the boycott is at least as big today. Dodging this stuff takes attention and effort, and occasionally one comes along that you can’t avoid …. Wee Red Bird, let me know when you find such an ad-funded coffee shop. And let me know if they’ll serve you if you’re wearing ad-blocking AR googles (which is a better analogy than avoiding to look at the ads, a mental impossibility if printed magazines are any indication). So again, if you think that ad blocking is honorable and not stealing content, then feel free to let the sites know that you are using an ad blocker. Declare the ad blocker in the user-agent header for instance. Wee Red Bird, a few more thoughts. To be honest, I see some merit to your analogy and it is making me think more (thanks). There are many things in a store that I’m not required to pay attention to (although the shopkeeper certainly hopes I do). On the other hand, there are relevant differences: (1) content and bandwidth of ad-funded sites are hardly offered as free doughnut samples, (2) automatic blocking is not the same as a lack of attention (and it’s hard to find a real-world analogy, until we get AR). Sincere curiosity and honesty on the part of advertisers will be helpful. This post is really helpful to understand ad-blocking because everyone is facing problems when they got unwanted ads during browsing. I purchased VPS Hosting with ad-blocking facilities and my site free from all adware scripts. Very Good! I’ll be using it.